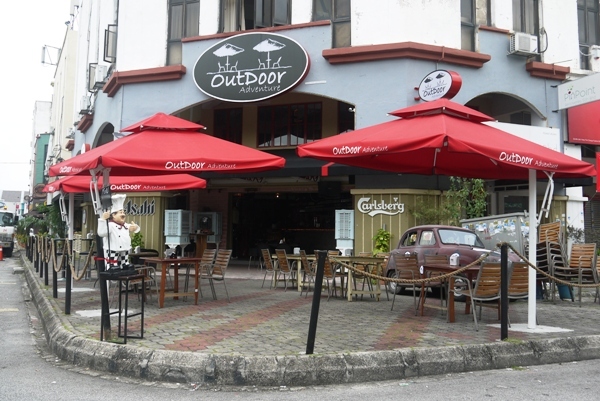 We arrived at Outdoor Adventure at about 1pm, the staff were busy prepping up the place, there was one guy wiping the glass doors, another was re-filing the bottles of sauces and we were the only patron at the restaurant…One could sit outdoor or in the air-conditioned indoor seating area. 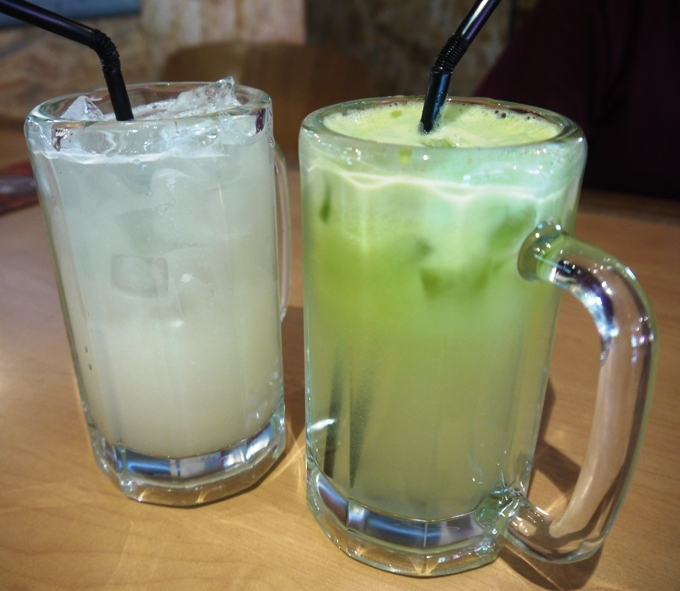 as it was a hot day, we chose to sit in artificial air..the ambience was cozy. So, if you would like to impress your date ( or potential mother-in-law) that you booked the whole restaurant for him/her, you might be able to pull it off here..yeah , just like in the movies ..
From the beer brands logos on display all over the place – you could tell that this was probably a place where people come to lepak for a drink or two..err..rather than for a quite Sunday lunch- that is. We had RM60 to spend ( yes, another online voucher thingy) and after doing some simple mathematics, the set meal of a fruit juice plus a main course for RM26 seemed rather reasonable. Charlie chose fish and chips while I selected the grilled pork chop. The grilled pork was also came from outside of the building to our table…Hmm..? the portion of the grilled pork chop was generous, and this came with the same side dishes as the fish and chips. The pork was tender and juicy. This was enjoyable. I didn’t use the black pepper sauce that came with the dish but enjoyed it in the ‘pure’ oink oink version. the sauce tasted good too though. When we settled our bills I asked for a name card and ehh..the name card said ‘Star Village’ , which was at the building next door..ok, that explained why the food came from ‘outside’. I am a magnet for getting lost, maybe the magnet short circuited the compass- hence the reason I am always getting lost..for that reason I got myself a GPS unit and err..i must have bought a defective unit for the unit will always either be in a ‘unable to locate satellite’ mode or telling me that I am in Jinjang when I am not any where near . Maybe the magnet short circuited the satellite too…and err..no offense to the people in Jinjang, I am sure it is a nice place and all that.. When I use the GPS, I also want to impose my ‘gut feel’ as well ( of which I have none but that didn’t stopped me )- which resulted in the GPS having to work overtime to ‘recalculate’ when I make a left turn instead of following the mat salleh accented directions telling me to make a right turn.. Sorry, we were talking about food horr..i somehow got lost.. 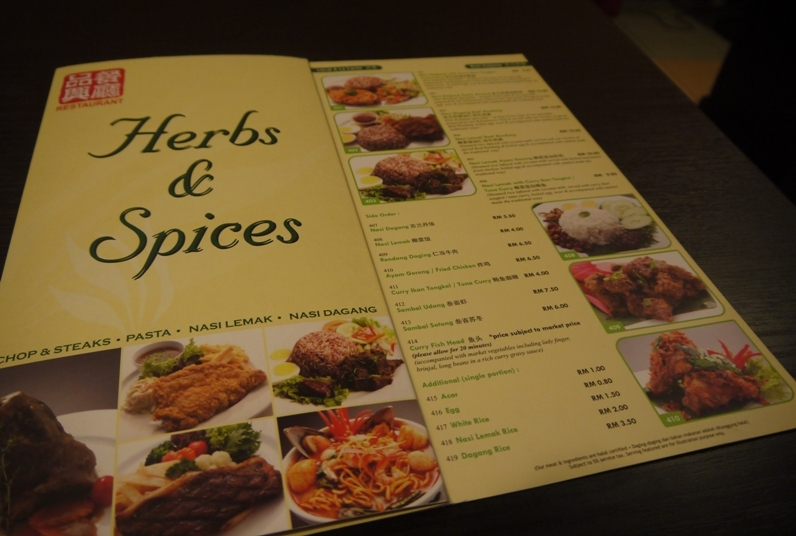 The meal at Herbs and Spices was a Living Social promotion where we paid RM20 and got a RM40 worth of spendomh . Good eh ? 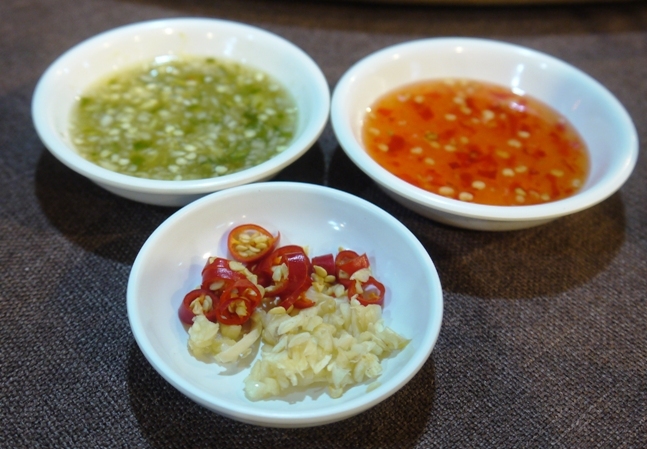 Finding the location was not too difficult, look for The Store at Sri Petaling and drive along the road and you will be able to see Herbss and Spices at the shoplots opposite The Store. Parking is a bit of a problem though, so good luck and be patient. We were lucky to find a parking space ( that made up for lost time – no pun intended) , we were shown to a table and given a colourful menu full of pictures. 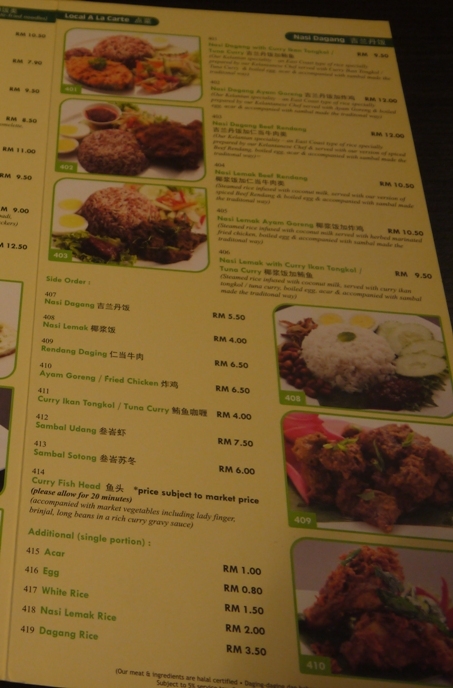 The front page of the menu condense the variety of the food served at the restaurant as : Chops and Steaks, Pasta, Nasi Lemak , Nasi Dagang. Salads and soups are available, including a breakfast menu .Desserts include : apple pie, cream caramel, sago Melaka, banana split. Peach melba. 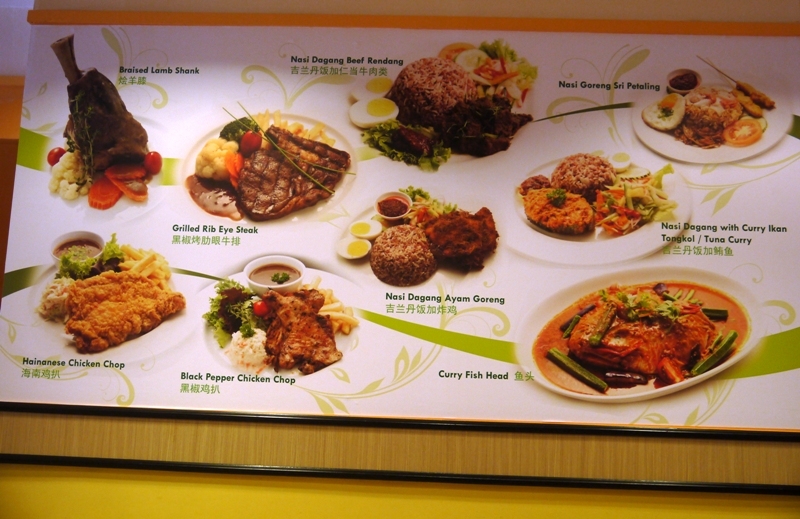 One of the wall was covered with pictures of what I guessed to be the chef recommendation – made my saliva also drop lah. 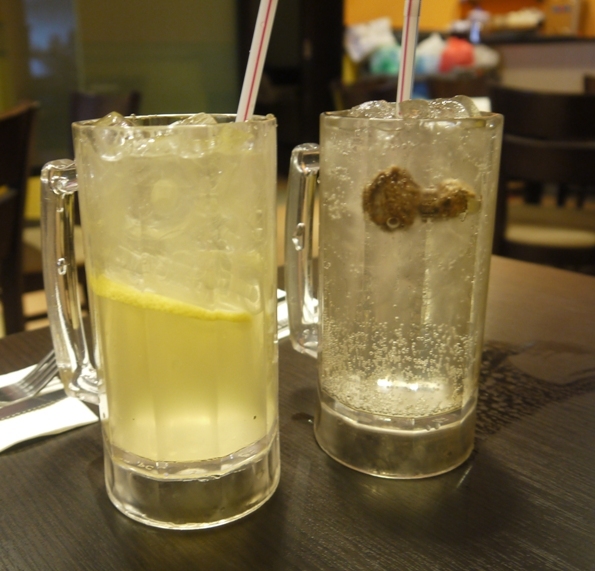 For drinks, we ordered a cold honey lemon drink ( RM4) and Assam Fizz ( RM3.50), the Assam Fizz was great, a gassy drink ( Sprite ? Ice Cream soda ? 100 plus ?) and 2 assam boi- yummy. I wanna try making this at home.. 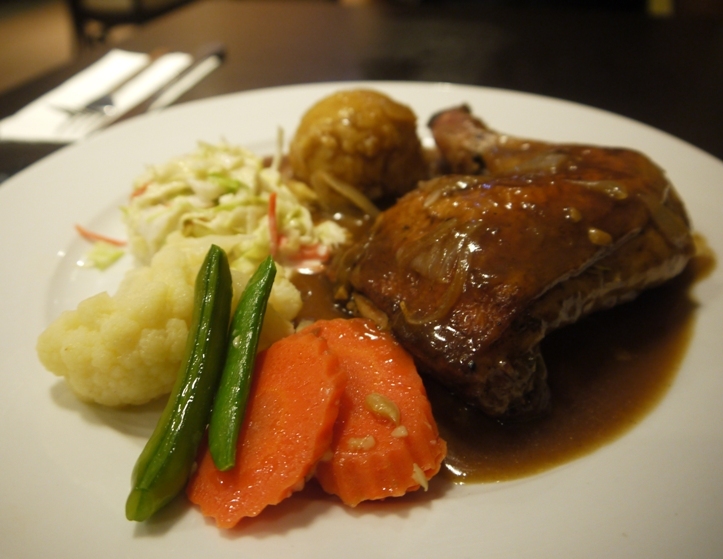 I ordered the Roast Herb Chicken ( RM15.90)- quarter chicken served with mash potatoes and coleslaw. The drumstick plus some, was tender and nicely flavoured, the herb-ish flavour wasn’t overpowering ( lucky). The black pepper sauce wasn’t heavy handed and went well overall with the mash potato, coleslaw and steamed vegetable- this was not bad. 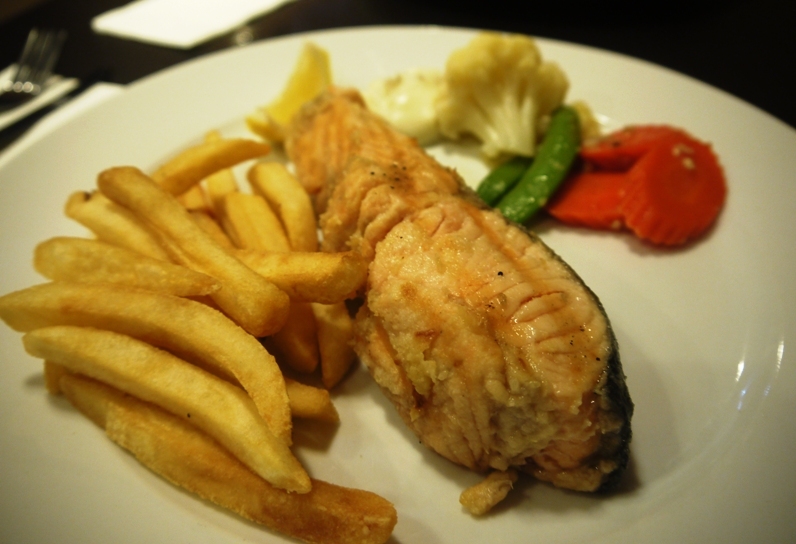 Carmen had the Grilled salmon ( RM19) – when I saw that thick chunk of salmon, I was envious, it looked really good , the thickness ensured that the salmon would not be overly dry and maintain a juicy and moist textute. This was yum ! 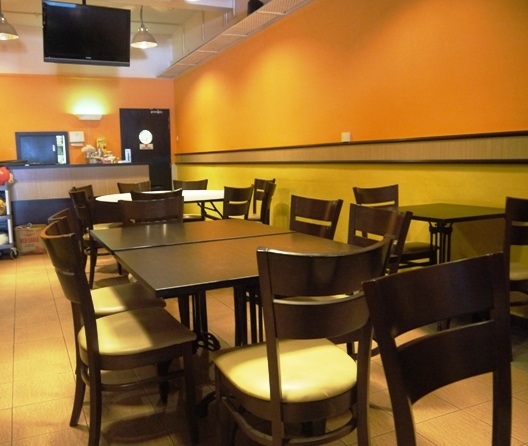 Overall, the food was enjoyable, the service was prompt and friendly and the environment was cozy. The bill came to RM44.50- which meant that we have to pay an extra RM4.50 on top of the Living Social Coupon- the actual damage was RM20 + RM4.50 = RM24.50 . Sweet ! Family, friends and colleagues (including bosses too) had gotten used to either having to turn the lazy susan around or moving the dishes- to be in the path of my camera viewfinder when they dine with me , ahh..what kind folks you lot are. And occasionally they will remind me ‘ Ekkk..why no need take pictures one ? I don’t normally take pictures or blog about the makan places when it is a re-visit, so, this could be one reason why I no take pictures one. 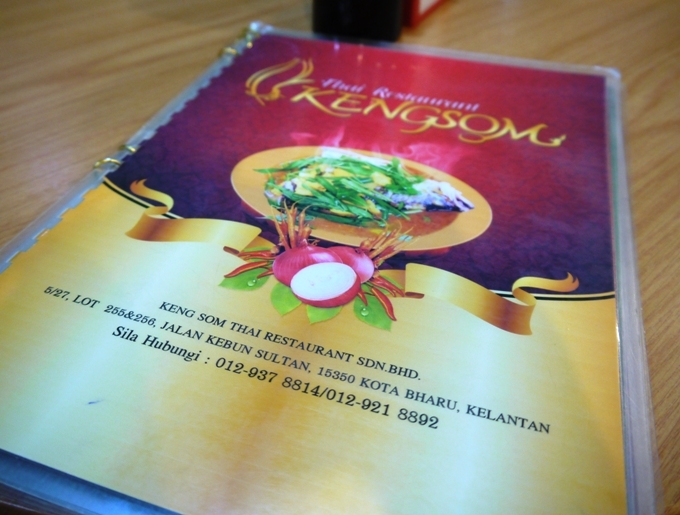 BUT in the case of Khengsom, I owe it to the world to write about it a second time..so, here goes..
My first encounter with Khengsom was when it was at Jalan Sultanah Zainab , you can read about it by clicking here. , but it had since moved to Jalan Kebun Sultan. 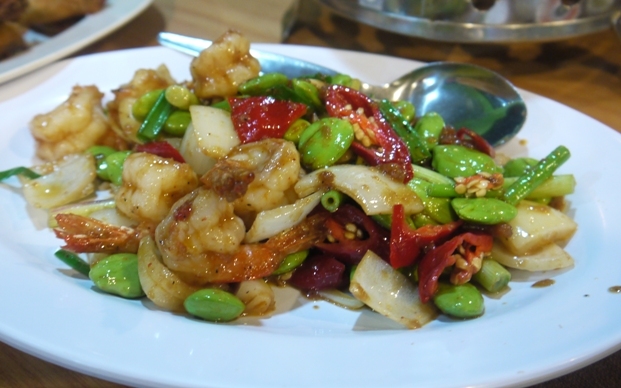 Frankly, when Khengsom was suggested, I did not have high expectations , due to past experience and thought that it would be hard to beat the likes of the Thai food at Wakaf Baru area, with the likes of Cheing Mai, Ban Kok , Kulim etc. 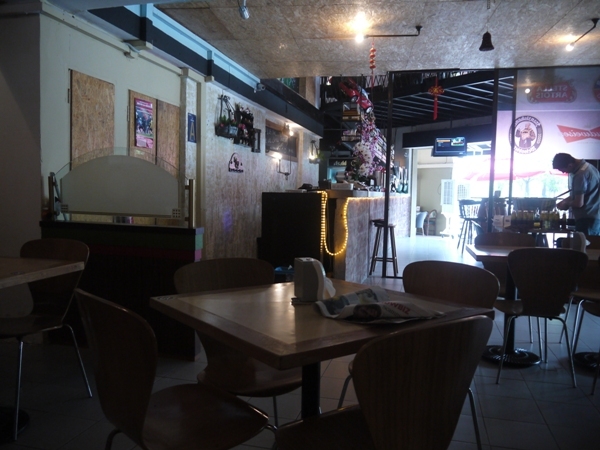 We arrived at Khengsom at about 8pm, the place was starting to fill up, Khengsom is a halal restaurant. The waitress who took our orders was friendly and she recommended to us some good choices as well. 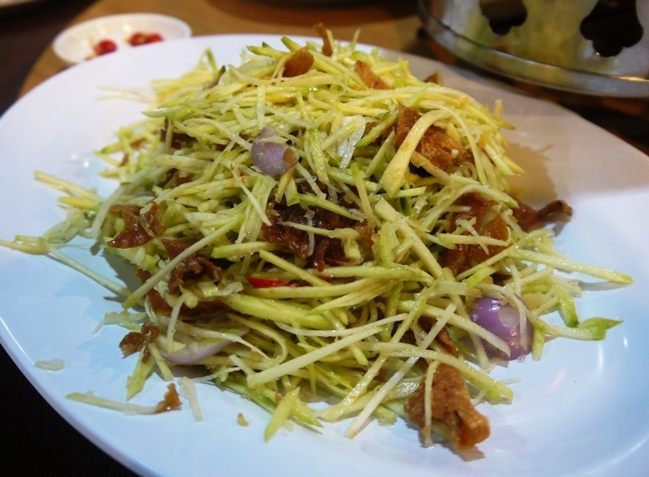 We started off with Mango Salad – a mixture of mango shreds, shallots,dried squid and chili padi made up this mouth watering entree. A good start , I am starting to be impressed ! 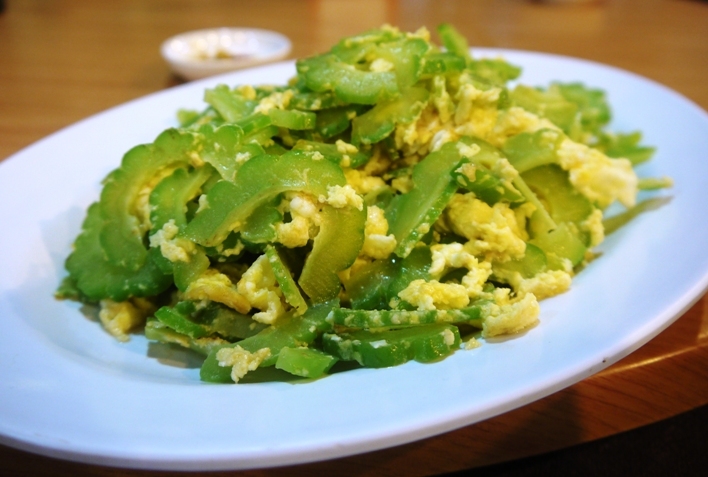 Fried bittergourd with egg, I am not sure can this be considered a Thai dish, but anyway, the weather was hot and bittergourd is said to be a cooling vegetable. This is a simple dish, but oh gawd, so well executed. The gourd was soft yet not mushy or wet, it just worked. 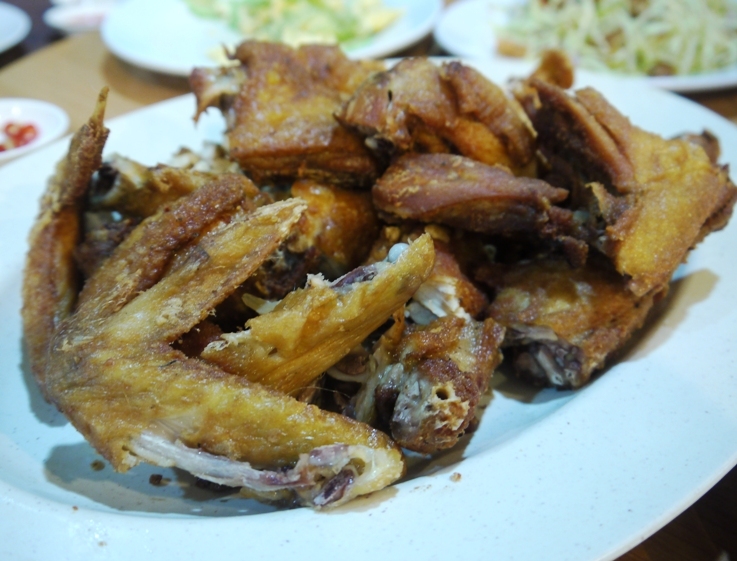 I think I have to start a Khengsom fan club soon..
Fried Kampung Chicken 42– the chicken was well seasoned with a bit of saltiness to it, the meat was tender and not dry. 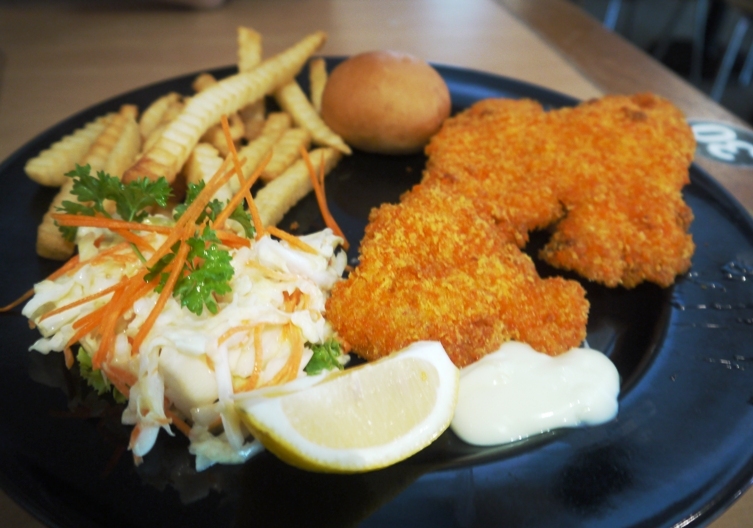 Maybe not as tasty as the fried chicken at Kulim, but still, not too bad tasting chicken. 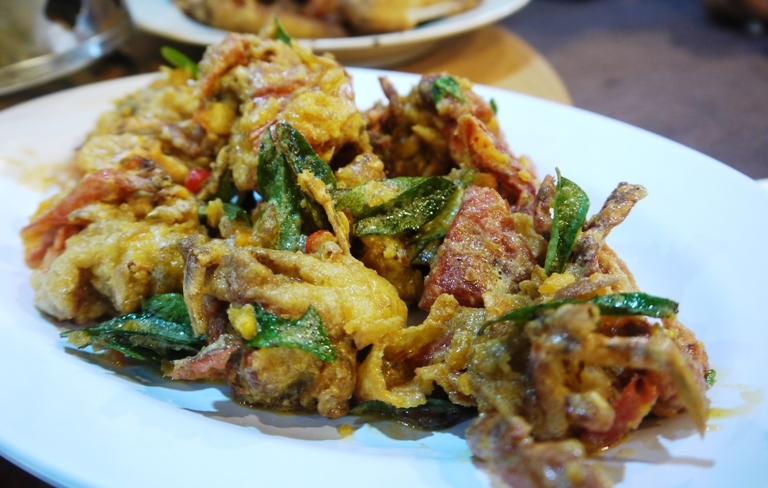 Soft shell crabs with salted eggs 55- If there is a heaven, this dish might probably be served in my heaven. So nice one ! The unique flavour of the salted egg blended with the fragrant of the curry leaves and of course plus the wonderful crabs was so very nice..so so very nice..
Squid with soy sauce – this is one other dish that will be served in my nirvana without having to worry about Lipitor . 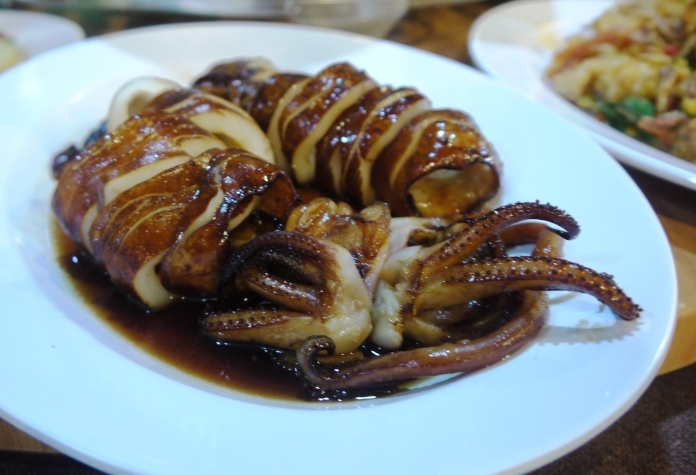 I don’t know how they do it, the squid had a bit of a charcoal-ed smoky flavour to it, the meat was soft yet springy but not tough, succulently fresh- it was almost unreal ! The texture might be best described like a sashimi . So so very good ! 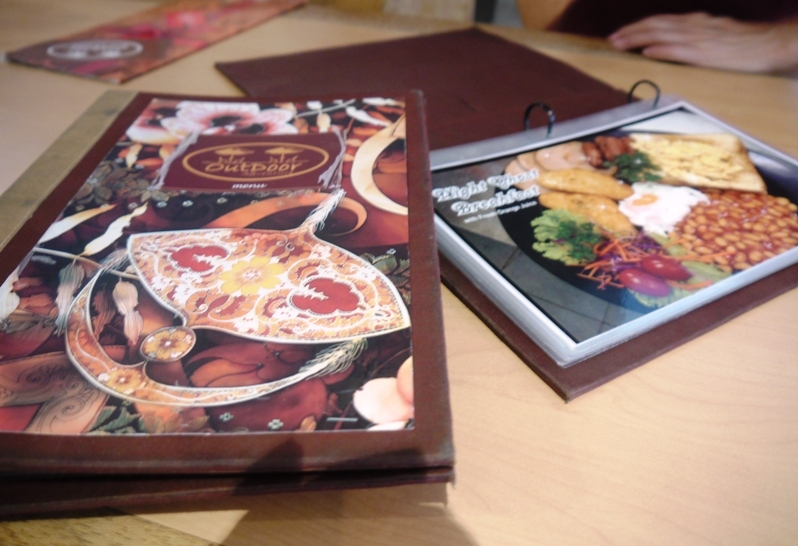 Everyone at the table commented that among all the Thai restaurants that we have visited in Kelantan – this is one of the best Thai food that we have tasted. 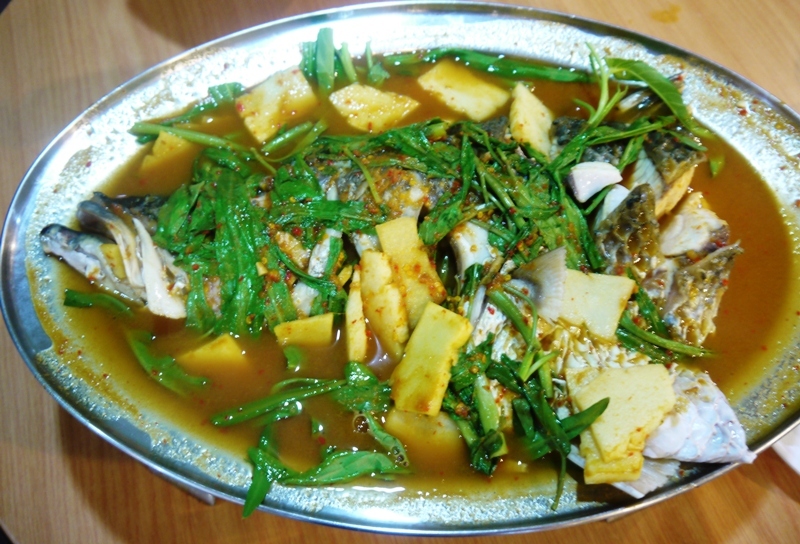 The flavours had more dimension and the tastes were more refined compared to the rest. Hurahh for KhengSom !